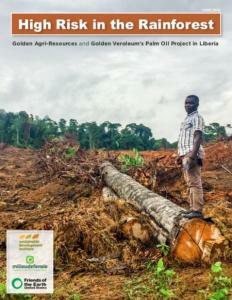 In August 2010, Golden Veroleum Liberia (GVL) signed an agricultural concession agreement with the Gov- ernment of Liberia covering 350,000 hectares, or approximately 2.3 percent of the country’s land mass. The land indicated in the concession agreement is densely forested, rich in biodiversity and customari- ly owned and used by rural communities as the source of their food and water, livelihoods and culture. Since GVL’s arrival in Liberia, the company has faced consistent and well-documented allegations of hu- man rights violations, environmental degradation and disregard for communities’ land rights. New find- ings indicate that GVL has failed to reform its operations, despite numerous complaints filed with the Roundtable on Sustainable Palm Oil (RSPO) since 2012, including a comprehensive set of complaints affirmed by the RSPO Complaints Panel in February 2018. GVL’s primary investor is Singapore-listed palm oil company Golden Agri-Resources (GAR)—one of the world’s largest palm oil companies. GAR established GVL through a series of investment vehicles in order to expand its palm oil plantations from Indonesia into West Africa while shielding itself from liability for the risks of the endeavour. As GVL’s primary investor, GAR bears substantial responsibility for the risks and im- pacts of GVL’s operations.